All Tripawds deserve a pain-free, happy life, but when a Tripawd parent attempts to build a homemade doggie wheelchair, we get nervous. That’s because after talking to canine rehabilitation experts and professional dog cart designers, we have learned that do-it-yourself homemade dog carts can actually cause more harm than good by putting a dog at risk of further injury. Since we aren’t dog rehabilitation experts, we wanted to learn when and how to properly utilize a wheel chair for a three legged dog. We spoke with two of the world’s leading experts in dog wheelchair design and usage, Amy Kramer PT, DPT, CCRT, of California Animal Rehabilitation Center, and Leslie Grinnell, President of Eddie’s Wheels from Shelburne Falls, Massachusetts. Is it Time for a Dog Wheel Chair? The loss of a limb presents different challenges for a dog than a human, Kramer tell us. The advantage to being a canine amputee is that a dog has three legs to distribute its weight over, instead of just one remaining leg that humans have. Despite a Tripawd’s adaptability, a three-legged dog can often benefit from immediate use of a wheel chair, especially if the dog already has per-existing physical ailments like arthritis, she explains. Grinnell adds that using a wheelchair on the longest walk of the day may decrease the damage to the spinal cord, elbows, carpus and rear legs, which are common age-related issues for front and rear Tripawds. “Think of the wheelchair as preventive medicine against the wear and tear of being three-legged,” she explains. If your dog cannot walk comfortably without rest for more than 30 feet, you may want to talk to a qualified veterinary rehabilitation therapist. If after an extensive pain management, rehabilitation and acupuncture treatment regimen your dog is still showing signs of pain, a cart might be the ticket to new found freedom and mobility. To the untrained eye, all dog wheel chairs might seem alike, but it’s critical to know the differences between a custom well-built cart that lasts a lifetime and a cheap mass-produced knock-off. “We know that this dog is pretty special if someone is looking into the cart option, so we take down the dog’s story and how it became disabled. We ask questions like ‘how long has he been coping with a disability?’ because a dog who has been three-legged for 10 years is going to have other issues besides just missing a limb. Usually the carpus has collapsed or the elbows are worn out, or there may be lumbar spine issues or ACL problems in the rear legs. So we want a complete picture of the dog’s anatomical and medical challenges. We often ask for a side view and overhead view photo. Many tripods develop a spinal curvature that we will take into account if necessary,” she says. As a pet parent with two bi-pawd dogs at home (Willa, Webster and Sweet Pea, as seen above), Grinnell’s company has firsthand experience with the issues that physically challenged dogs face. “We think of our dogs as our research and development team. We really do test our products on animals!” she says. 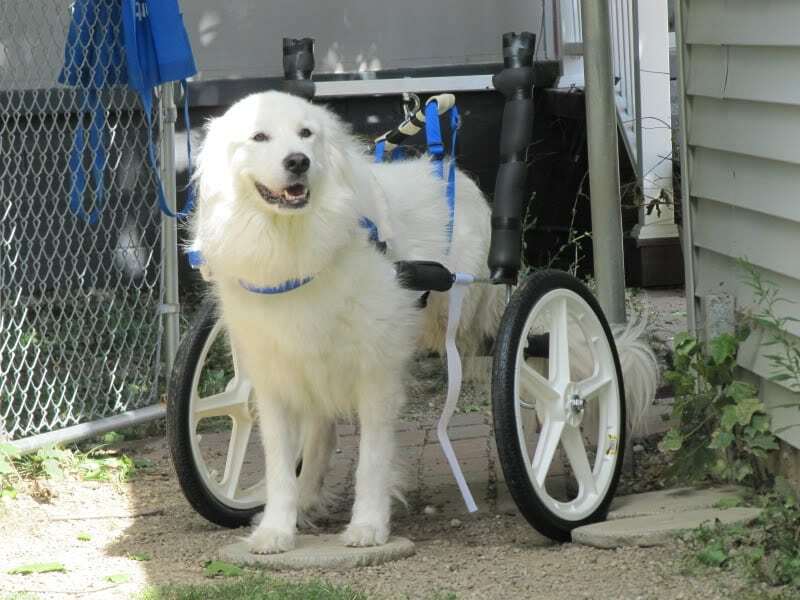 Finally, Grinnell says that Eddie’s Wheels also makes the only front wheel cart for front leg amputees, which enables these dogs to sniff, run and sit in their wheels while preventing the “bunny hop” walk that leads to stiffness later in life. The benefits of a custom-built dog wheel chair are obvious, but oftentimes affordability is a big issue. A custom Eddie’s Wheel cart can cost anywhere from $325.00 to $650.00 depending on factors such as the size of the dog, the type of wheels needed to match their exercise terrain and many other custom design features. Although wheel chairs are covered in some pet insurance policies like VPI and Pets Best, this expense is often a barrier for financially-distressed pet parents. For these customers, Grinnell says that getting creative is often the path to obtaining one. These organizations in our Tripawds Financial Resources Document might also be able to help. “We also have a stock of donated used carts and if one fits, we are happy to sell it at a reduced price, refurbishing and customizing for a new dog,” says Grinnell. As Tripawd parents already know, dogs adapt much better to challenging circumstances than humans do. For most Tripawds it only takes about a week to learn how to use a properly fitted and professionally built dog wheelchair after fine-tuning is made through the help of Eddie’s Wheels staff and their instructional videos. When a Tripawd is allowed to use his new wheel chair after taking a long, tiring walk without one, the dog will often instinctively understand that the supporting wheels provide respite and relief. She adds that as a Tripawd ages, pet parents need to be on the lookout for signs that might indicate there is an issue in one of the dog’s remaining limbs. To learn how to spot potential ailments that could affect your Tripawd, find see a certified canine rehabilitation practitioner near you. Please note that Tripawds has no affiliation with any dog wheelchair manufacturer, nor do we have personal experience using a wheelchair for either Tripawds Founder Spirit Jerry or Tripawds Spokespup Wyatt Ray. If you have experience using a wheelchair for your dog, please provide feedback with a comment below. Or post any questions in the Hopping Around Discussion Forum. We rescued a tripawed dog at 6 or 7 months old. She is a chahihuahua minpin mix. She was abused and had to have her rear right leg amputated at 6 weeks old. She has always gotten around well. She is now a year and a half and now has to have knee surgery, sometimes she can’t walk at all, but the surgery isn’t for another week and a half. (We live in a very rural area and have very limited choices.) The vet said she has to be completely off her leg for 2 weeks. I’m just wondering how we are going to do that. She is a very energetic dog and he said it will not be completely healed for 8 weeks. Is there any advice on how to curtel her from trying to get around too soon? Her name is Mercy Grace and very loved by all of us but especially my daughter Kari, but I will be the one at home to care for her since my daughter is in school. Any suggestions or help will very much be appreciated. Thank you so much. Hi Denise. Thanks for giving Mercy Grace such a great home, she’s so lucky to have you. It’s not the first time something like this has happened, quite a few members have been through similar recoveries that required such restricted activity. These Discussion Forum search results will be helpful for you. Do consider posting in the Forums where you can get lots of input from our community OK? Best wishes for a speedy and easy recovery! Milo is a 5 year old almost-standard poodle who lost his front leg at 5 months of age. All his life he has been extremely energetic and acrobatic (that’s what got him into trouble in the first place!) but over the last year he has started to get pain. Vet says his remaining front leg is like no other she’s seen – stiff, thick and arthritic. Acupuncture helps for a week or so, so do anti-inflammatories, and I have a pram for him… but I’ve put my back out pushing it. I have always told him “no wheels” but now I can see that I can’t have him euthanised when the pain gets too much… Not sure how I thought that in the first place, but I can see now that he is a wild, vibrant dog and he’s in pain, and he’s my best mate. My question is about wheels. I am worried that I will be forcing them on him, that if I strap him into front wheels he will have no choice but to run around with the wheels and he might not like them. Or that they will be dangerous if he tries to do circuits with another dog at the park. I don’t want to buy them, ship them to Australia and discover they aren’t right for him. Can you advise me please? The best thing to do is to find a certified rehab therapist near you. Wheels can add quality of life to older Tripawds, but they’re best introduced with the help of a professional. If you can work with a veterinary teaching hospital at a local university, even better. Not sure where in Australia you are but you may want to check out Ziggy’s story…if that college is near you, that would be a huge help. I have a medium sized dog with a front leg paw unable to use. She is about 12 yrs old and starting to have trouble walking. She has all four legs but one front leg is paralyzed. Is there a cart that would support her left side and allow her to ease the load of her body to walk??? Thanks for asking Nanette. We recommend consulting with a certified rehab vet. You might also talk to Orthopets to see if a brace will help, they do wonderful work. Any of the wheelchair/cart manufacturers we mention in this post should also be able to better address your concerns. Hi Kristen. Yep, recovery is full of ups and downs but just keep track of the positive advances and pretty soon it’ll be behind you! I’m glad to hear Ryder is doing better each day. Core strengthening exercises are essentially the same for all types of dogs, and you can find lots of them in our Tripawds Gear Blog Fitness page (also search for “strengthen” and “core” in the blog itself), as well as by checking out our CARE videos from canine rehab experts. I hope this helps! Congratulations on making it to the finals of the BlogPaws contest! We just wanted to say hello! You’ve got a wonderful and inspiring blog! We are finalists too and are honored to be in such good company. We have a dog that is about to be a two-legged boy, both hind legs will be removed on the 27th of March. Cinders is already enjoying a cart and can really move out with it. He is a shelter dog waiting for a new home. After his surgery, I will hopefully post a video of him. His legs need removing because they are frozen and when he scoots around on his rump it twists his spine too much and is starting to cause him pain. I just wish he could lie down with the cart on. The cart is what saved him from possibly being put down plus a vet and tech that really believe in him. Oh Susan that is really awesome you guys are there for him! We would love to hear more, do share his story in the Forums. Keep us posted OK?